Bornemann's Afield Mobile Updates: The Stalking of the Death Row Buck. The Stalking of the Death Row Buck. 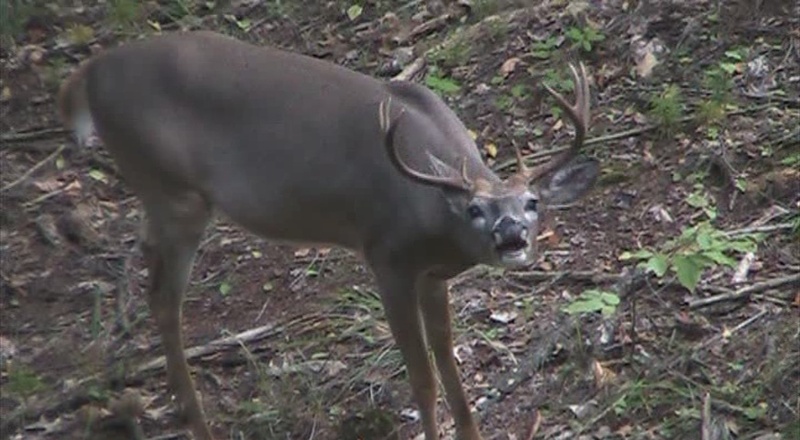 The story of this buck begins on opening day of the Wisconsin archery opener in 2009. Bornemann’s Afield team member Tim Langille laid his eyes on a buck as it spent 20 minutes under his stand, feeding on acorns, mushrooms, and maple leaves. 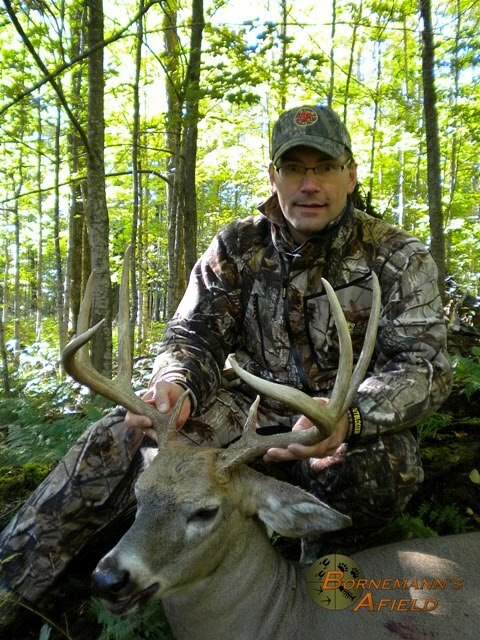 Tim deliberated a bit, but knew in his gut that this buck needed at least a year. The headgear on this buck hat a lot of potential with hint of towering G2’s in his future. His G2’s also lay open slightly, mimicking the curved shape of a pumpkin. One telling body feature also stuck out…a bob tail. Short brow tines and lack of mass would save this buck on this day. Within days, the team had a name for this buck – Death Row. We figured someone in the area would have this borderline buck down before season’s end, thus his days were numbered. And if not, one of us would not likely give him the pardon next year. Before the season of 2009 ended, both my brother Brian and I each had a golden opportunity at this buck, but gave him the pardon. 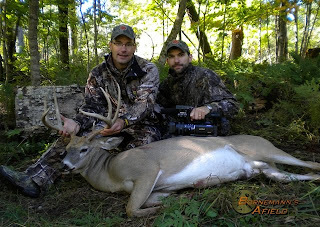 Fast forward to 2010…Late summer trail cam pictures showed us an impressive 9 point buck hitting various food plots and wooded trail camera locations. He reminded us of the Death Row buck, but it was hard to believe how much antler he would have had to put on. We kept looking for the bob tail, but could never get the right shot angle on trail cam for it to be definitive. Opening day 2010 had me in a towering hemlock tree, adjacent to a watering hole. My brother Brian was over my right shoulder with the camera capturing every detail of this perfect morning. Blessed with 42 degrees with a light breeze gave us relief from the mosquitos that had plagued our cousin Kevin’s bear hunt. Three hours on the stand and we had nothing coming in. In that time, the wind had also made a shift. Little did we know what factor that would play in the hours to come as we descended the tree. This area was typically full of acorns by now, but the wet weather had them dropping earlier and we decided needed to find a fresh mast to set up on. Fortunately, I had a stand that lay in waiting for us nearby, ready to be set, and the telling crack of acorns hitting the ground every few minutes told me we were in the right spot. Tim, who also got skunked that morning, was with me, along with Brian. Tim and I were checking an area were several trails converged for this set when Brian got our attention, placed his thumb to the side of his head, and spread his fingers - the universal sign for “Buck”. The buck was about 80 yards from us with his head mostly hidden behind some undergrowth. As we looked through binoculars, we could feel the breeze in our face. As he quartered away from us, I could occasionally make out the extensions of antler. This buck was a shooter. And, if by some divine intervention, the sun was at our back. It was the perfect set-up for a stalk. I grabbed my bow and it was game on. The buck was on a mission to feed. On this morning, it looked to be ferns that he was craving. I stayed downwind of him, using what little cover this hemlock forest gave us. The sound of my movement was hidden by the rush of the steady breeze. 50 yards and closing…Tim dropped back with the binoculars with a front row seat to the action. Brian trailed behind me with the camera. The buck was on a slow and steady pace. 40 yards and closing…Thick undergrowth was between us. 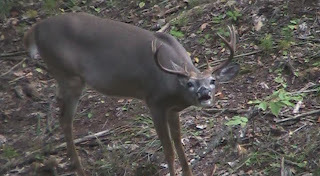 The buck was still head down and feeding as my breathing deepened. Not nervous, but excited that we were in such a position and all the cards were dealt in our favor. 35 yards and closing…I needed to get to the logging trail just yards ahead to get an open shot. I left the camera man about 10 yards behind me as I inched across the trail. 26 yards….the buck was still oblivious. I drew on him and sent my broadhead sailing through both lungs. 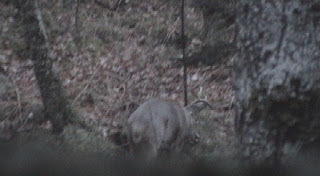 The buck squatted down and went into a dead run for about 40 yards. At which point he took his last breath and fell out of sight of the camera in the thick raspberry growth. What a great sense of accomplishment it was to get my hands on this bucks 11” G2’s with an inside spread of 16.5”. And a quick glance at the bob tail of this massive 200 plus-pound brute of a deer confirmed that Death Row had become the buck we had hoped that he would. And to share the moment with companions was proof that “The Pursuit is the Reward”. I’m tagged out on opening day and looking forward to a mid-season of grouse hunting, chasing muskys, and filming the rest of the Bornemann’s Afield team.